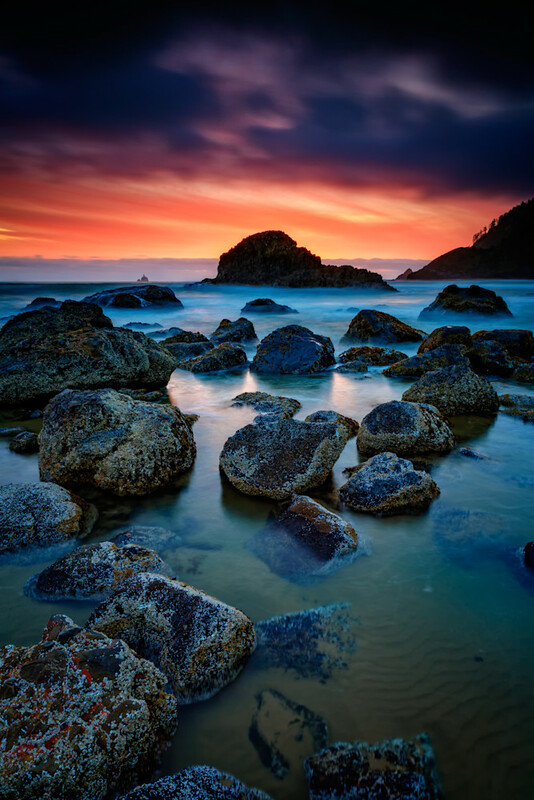 The sun sets over Indian Beach, in Ecola State Park, Oregon. Ecola State Park, wrapping around Tillamook Head, between Seaside and Cannon Beach stretches along 9 miles of coastline and offers outstanding sightseeing and recreation opportunities combined with a storied past. The sun sets over Indian Beach, in Ecola State Park, Oregon. Ecola State Park, wrapping around Tillamook Head, between Seaside and Cannon Beach stretches along 9 miles of coastline and offers outstanding sightseeing and recreation opportunities combined with a storied past. I managed to photograph several stunning sunsets during my visits to this area, but this one was different, starting out as just a gray sky before the color simply exploded just as the sun dipped below the horizon.